Stepping Up for Children - Planet Aid, Inc.
Twelve-year-old Neeraj’s clear eyes, bright smile, and loud greeting are impossible to miss while visiting the Step-Up Center in Dharuhera. A native of the Panna District of Madhya Pradesh, Neeraj has been studying at the Center for seven months. During that time, he has never missed a single lesson. The young boy had arrived in Dharuhera three years earlier with his migrant-laborer parents, who were in search of better economic opportunities. Upon arrival, Neeraj stopped going to school and instead began working various small jobs. "Once we came here, I got involved with some other migrant kids who lured me into earning money,” said Neeraj. This set of circumstances are all too common in India. Unfortunately, once a child's educational progression is derailed in this fashion, in most cases he or she finds it difficult to get back on track without focused support. As his time away from the classroom increased, Neeraj's antipathy towards school grew stronger and he told hismelf he never wanted to return. But a natural curiosity and desire for learning can lay dormant only for so long. Neeraj’s shrewdness and advanced ability to grasp new concepts was noticed by the Step-up Center team surveying out-of-school students in the region. 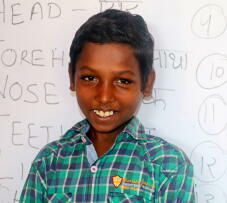 They approached him, and with encouragement from his parents, Neeraj started lessons at the Step-up Center at Dharuhera. Neeraj’s native intelligence quickly brought him on par with peers of the same age attending government schools. Step-up Center staff helped facilitate Neeraj's transfer to the nearby government school, and at the beginning of the new academic year Neerja will begin classes there as a grade 6 student. Neeraj does not want the same hard life of his parents and he is determined to find his own path. “I want to be a doctor when I grow up. I want to cure people’s ailments,” he said with a contagious smile. and toward a better life. Donate today. Planet Aid supports the education of children like Neerja who are living on the margin in India through the Step-Up Centers. These schools provide a supportive environment and access to education for children who have been shut out of public schools because they lack needed documentation to register or otherwise had to drop out. The program enables youth to complete their elementary school education through grade eight, either through classes offered at the Step-Up Center itself or by supporting them in the mainstream school system. Step-Up Center staff also mobilize parents and community members to support education and work with local authorities in obtaining needed registration documentation for students. Gaps in access to education are among the key reasons that poverty remains endemic in India. Nearly 60% of the population live on less than $3.10 per day according to the World Bank. Children are particularly prone to the ravages of such an existence and are frequent victims of violence, disease, and trafficking. You can help support the work of the Step-up Centers with a tax deductible donation. The Step-up Centers are operated by Planet Aid's local partner organization, Humana People to People India. The program has grown rapidly since it was first introduced just a few years ago. There are currently 122 centers reaching more than 4,800 children. In 2017 the program seeks to reach 14,000 children in the state of Haryana, expanding its network to 560 Centers.